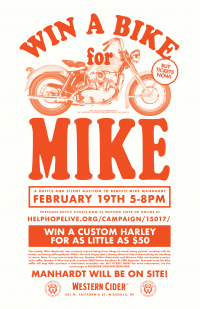 HELP OUR BUDDY, MIKE, BY BUYING RAFFLE TICKETS FOR A CHANCE TO WIN A CUSTOM HARLEY! Tickets are $50 and sold at the link, below. Stay tuned for photos of the bike. Mike Manhardt was seriously injured doing three things he loved; being outside, working with his hands, and being self-employed. Mike’s the kind of guy that’s always there to help without asking for anything in return. Now, it’s our turn to help him out. Number 8 Wire Motorcyles and Western Cider are hosting a motorcycle raffle. Number 8 Wire has built a custom 2000 Harley Davidson XL1200 Sportster. 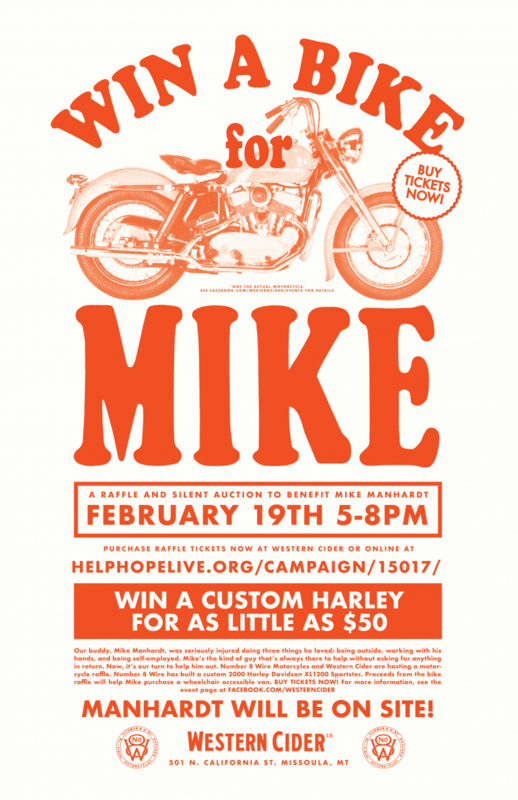 Proceeds from the bike raffle will help Mike purchase a wheelchair accessible van. What happened to Mike? Well, while working on a logging project near Condon, MT, an accident left Mike with broken C6 and C7 vertebrae. His work partners acted quickly and first responders got him out of the woods safely so he could be life-flighted to Missoula. Emergency spinal fusion surgery was performed within hours of the accident at St. Pat’s hospital in Missoula. When Mike awoke from surgery, he had some movement in his arms and no movement and faint feeling in his legs. He was transferred to Craig Hospital in Englewood, CO for rehabilitation and has been working hard to become independent, but still has to work extra hard on doing things most of us take for granted. There’s a long road ahead as he moves from inpatient at Craig to outpatient rehabilitation. Mike has medical insurance. He still needs our help, though. Mike will have medical expenses to pay well beyond his insurance coverage and he won’t be able to work during his outpatient recovery. This is what he needs our help with!